Those interested in symbioses and in new sequencing methods should look at a paper that just came out in PNAS by John McCutcheon and Nancy Moran (OK – I am a bit biased – this work is related to something I did previously with Nancy). Their paper reports a further dissection of a dual symbioses in sharpshooters (a group of insects that feed on xylem sap). The dual symbioses involves two types of bacteria that live inside specialized cells in the gut of these insects. Of all the possible sharpshooters (the symbionts are found in all sharpshooters), Nancy chose to focus on the glassy winged sharpshooter because it is an important pest organism (it is a vector for Pierce’s disease in grapes). So – we (well, the core facility at TIGR under my supervision) sequenced the Baumannia genome using DNA that Nancy had isolated from dissections of the gut of glassy winged sharpshooters. In analysis of the genome we (well, again, the royal we — in this case Dongying Wu in my lab did most of the analysis) found, among many things, that Baumannia appeared to be making vitamins and cofactors for the host. But alas, we also found something missing — Baumannia did not appear to be able to make amino acids for the host. Since xylem was likely to be missing amino acids that all animals require in their diet, we had figured that Baumannia must be making them for the host. So we were vexed. That was, until Nancy pointed out (or reminded us – since she probably had mentioned it before) that there was another symbiont living in the gut of these insects — a symbiont called Sulcia. She suggested that we look at the DNA sequence pieces that did not assemble with the Baumannia genome and look for any that might encode genes similar to genes from the group of bacteria in which Sulcia is found. And, 1.5 years later, after much informatics and lab work, we obtained about 130 kb of the genome of this second symbiont and found that it encoded at least some of the essential amino acid synthesis pathways that could make the needed amino acids for the host. And we stopped there, published a paper in PLoS Biology proposing the existence of a dual symbiosis with one symbiont making vitamins and cofactors and the other making amino acids, and moved on to other things. 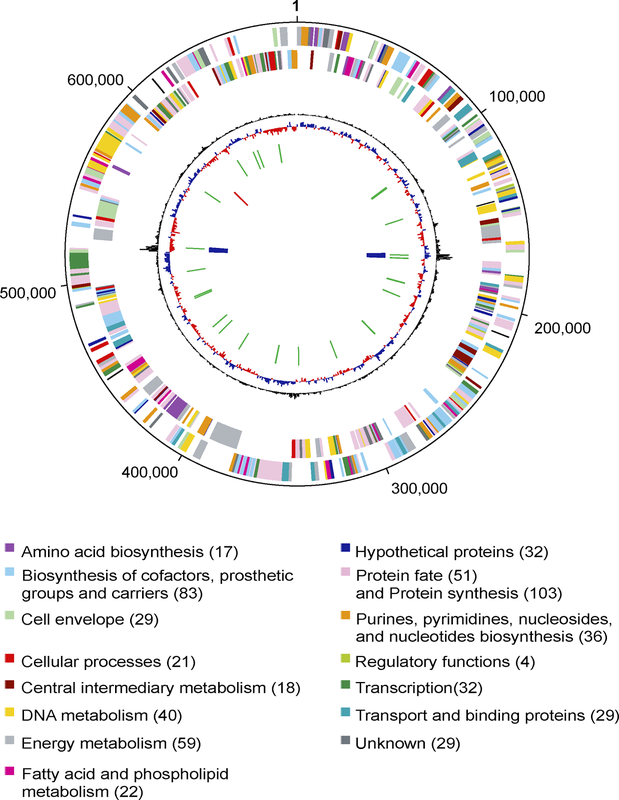 Now in this new paper, Nancy’s lab has returned to this symbioses and has finished the genome of Sulcia (the genome is available here in Genbank). And the story just gets cooler and cooler. With this complete genome they get a more detailed picture of the symbiosis than we were able to obtain, and are able to really reconstruct the whole system (and correct some mistakes we had made in our paper). My favorite thing in their paper is Figure 3 which you can find here (I am not sure about the PNAS policy of putting the image in my blog since this does not seem to be an Open article). This figure shows their reconstruction of what could be called to community metabolism. Interestingly it appears the symbionts depend on each other and are not just passing things on to the host separately. Another important aspect of their paper is that it is the first (as far as I know) example of a genome being finished using a combination of the two hot new sequencing methods – 454/Roche and Illumina/Solexa. Basically they used the Roche/454 method to provide deep coverage of the Sulcia genome and then used Illumina/Solexa sequencing to get accurate sequence data for the types of sequence for which the Roche method does not work well. So – check out the paper in PNAS. You won’t regret it. I’ve been wondering for a while why multi-cellular species are not able to synthesize so many things themselves and must rely on symbiotic single-celled organisms inside them. Is there some sort of complexity limit that causes this or is there simply so much greater diversity among single-celled organisms that piggybacking off their talents is something of a free-lunch? Overall, I think in most cases the explanation is more like the latter. I think that there are many means by which organisms can evolve novelty. But if the probability of a solution coming through symbioses is really high, as it seems to be in many cases, then there is no chance for other solutions to evolve — once a sap feeding insect evolves a symbiosis to get its amino acids, there is little selective pressure to evolve amino acid synthetic pathways on its own.